We’d love your help. Let us know what’s wrong with this preview of S-Boote by Jean Philippe Dallies-Labourdette. 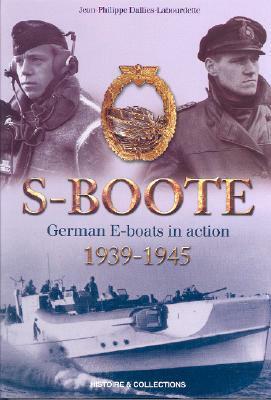 To ask other readers questions about S-Boote, please sign up. Histoire & Collections is very similar to Osprey in my viewpoint, essentially a very good French publisher that puts together photograph heavy books packed with information on a very specific topic. This book is all that, and is superbly constructed with high quality paper and binding. That said, this is indeed a translation type of book, so there are a fair number of awkward attempts at English sentences. I'm ok with that, because honestly it does not diminish the understanding or education Histoire & Collections is very similar to Osprey in my viewpoint, essentially a very good French publisher that puts together photograph heavy books packed with information on a very specific topic. This book is all that, and is superbly constructed with high quality paper and binding. That said, this is indeed a translation type of book, so there are a fair number of awkward attempts at English sentences. I'm ok with that, because honestly it does not diminish the understanding or educational value. What I'm not ok with is typos. Misspelled words and a handful of poor edits cutting words off inside of captions took away the 5 star brilliance this book was heading toward. Almost perfect, the author's efforts were letdown some by the editing and publishers. The author assembled a tremendous amount of E-Boat photos and created a nice history of the German units and their actions. Every page has interesting scenes, varying from the mundane like torpedo loading to action shots of boats operating at sea. I gained so much knowledge from these, and I will surely put this to use in my wargames and diorama constructions. The bravery of the crews of these kind of boats which fought on both sides amazes me, and I have gained a great deal of respect for these unusual warriors. I should mention that there are many pictures included of Allied torpedo boats and ships tangling with the E-Boats, adding a real bonus for me as I will surely now research some the Allied types. The author does an excellent job organizing the information by years, and thoroughly discussing designs, deployments, and actions. This book is worth the price if only because it covers a topic that is almost never addressed: the small vessel engagements that were commonplace and fierce on along most of Europe's coastline during the war years. However, it immediately becomes clear that this book was not originally written in English, and the poor translation and syncopated writing style detract from what could be a rare gem of a tome.